Europe’s 2015 started and ended with terrorist attacks in Paris, which had spillover effects in Belgium and several other European Union (EU) Member States. But terrorism, and the public anxiety and sense of insecurity it generates, may not prove to be the year's defining issue for Europe, even as it has exacerbated mistrust between Muslim and majority communities in many places, and tipped the equilibrium point toward security and away from privacy for the foreseeable future. The massive growth in migrant and refugee flows entering European space has been Europe’s defining challenge in 2015. More than twice as many asylum seekers and migrants—859,000—arrived illegally on Greek and Italian shores during the first 11 months of 2015 than in the previous five years combined, according to Frontex entry data. The traffic spawned a deadly toll: 3,695 people are thought to have died or gone missing crossing the Mediterranean this year alone. The European Union’s response over the course of 2015 was both slow in appreciating the nature of the challenge, and totally reactive. There is little evidence of long-term strategic planning, opening rifts between the European Commission and Member States, and among Member States, over appropriate policies and burden-sharing. The short-sighted focus on moral responsibility (by implementing search-and-rescue operations) and the “shadow-boxing” that is at the heart of the attempt to target smugglers came at a huge cost: missing a crucial opportunity to act when flows were still manageable. Months of ad hoc policy decisions and internal feuding resulted in an existential crisis both for European institutions and some of the European Union’s signal achievements, most notably the Schengen system (which has gradually eliminated Europe’s internal borders). As trust among Member States—and between national- and EU-level policy authorities—continues to erode, the European Union has found its ability to implement a more comprehensive response severely handicapped. 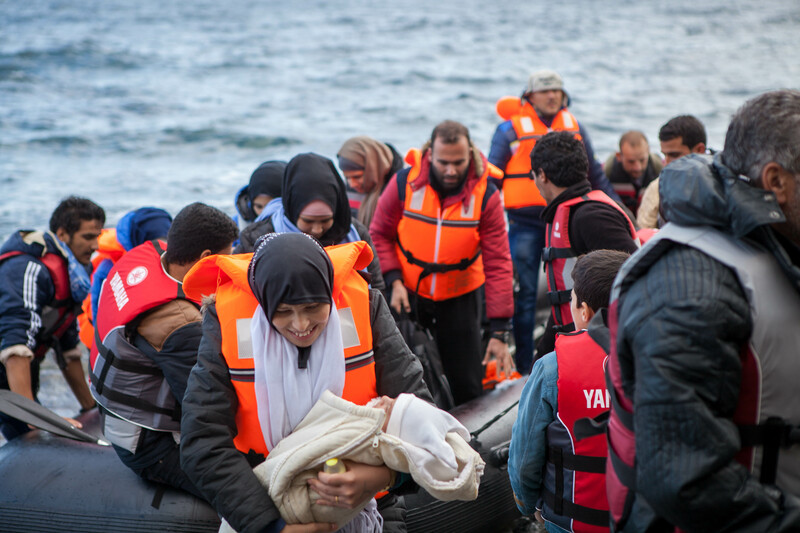 A series of tragic deaths in the Central Mediterranean in April 2015 prompted the first major continent-wide policy response from the European Union. The initial efforts focused exclusively on the immediate emergency response—to the exclusion of longer-term, more holistic thinking. Appealing to Europeans’ values and sense of moral duty, the European Union proposed conducting search-and-rescue operations and, more ambitiously (but less thought out), targeting smuggling operations in Libya by destroying the barely seaworthy fishing boats used to ferry migrants to Italy (for more on EU responses to smuggling networks, see Issue #4: Big Business of Smuggling Enables Mass Movement of People for Enormous Profits). What European policymakers did not attempt was focusing on stemming the tide of arrivals by addressing either the factors pulling individuals to Europe (such as the near-certainty that even those without protection claims would not be returned to their home countries once they set foot in Europe) or the conflict, violence, and lack of economic opportunities pushing them from their homes. Moreover, EU and national policymakers chose to ignore long-standing cracks in Europe’s common asylum system—including the division of responsibility for asylum claims among Member States—that had begun to widen in the face of growing demands on the system. Almost every corner of Europe felt it was saddled with a disproportionate burden: from frontline states such as Italy and Greece (and later, countries along the Western Balkan route) that were overwhelmed by immediate arrivals, to wealthier nations such as Germany and Sweden that found themselves responsible for massively disproportionate intakes of refugees, to Central and Eastern European states with scant histories of immigration that faced the prospect of integrating Muslim refugees for the first time. The gulf between Member States had never seemed wider. The initial focus on the crisis in the Central Mediterranean further diverted attention from what would soon become ground zero: the Greek Aegean islands. The much shorter sea route from Turkey to Greece (favored by increasing numbers of Syrians), combined with large-scale instability in Libya, resulted in a dramatic shift in smuggling routes. Exponential increases in the numbers of migrants crossing into Greece and traveling north through the Western Balkans to reach other EU Member States—combined with migrants originating in the Western Balkans themselves—created a mighty river of human beings that initially rivaled, and by mid-summer eclipsed, the Italian route of entry. As the flows to Greece and north through the Former Yugoslav Republic of Macedonia, Serbia, Hungary, Austria, and onward escalated, Europe found itself confronted simultaneously with three massive, interrelated crises: (1) a migration and border-control crisis in both the Central and increasingly the Eastern Mediterranean; (2) a growing protection crisis as national asylum systems had to sort through mixed flows comprised of a dozen different nationalities, including large shares of arrivals likely to be granted protection (such as those from Syria, Iraq, Afghanistan, and other unstable states); and (3) a humanitarian crisis as tens of thousands of migrants—in phalanxes as long as the eye could see—sought to undertake the journey by foot to their EU country of choice (most often Germany and Sweden, this century’s apparent promised lands). Amplifying these intersecting crises was a mass media that broadcast a nonstop stream of pictures, interviews, and special reports, effectively becoming the indispensable “force multiplier” for making the case for open-ended humanitarian action. As these three crises converged to create a political perfect storm, European leaders found themselves increasingly unable to ignore certain issues—such as distribution of responsibility—that they had avoided in the spring. With the capacity to properly receive and process new asylum arrivals in some more popular destinations overwhelmed, simmering political divisions and mistrust between Member States on issues of asylum and border control began to boil. Sharing the massive challenge of processing and caring for the new arrivals across the continent became an urgent priority. The European Union promoted a formula to distribute initially 40,000, and eventually 160,000, successful asylum seekers across the European Union over a two-year period, a plan that now seems insignificant in the face of the nearly 1 million arrivals in 2015. Despite vehement opposition from several national governments, particularly those in Eastern Europe that had been spared from the crisis up to that point, a coalition of powerful Member States, led by Germany and France, was able to push the plan through. But the choice to compel Member States to agree to a relocation scheme may prove to be a classic Pyrrhic victory: the costs of forcing “more Europe” on recalcitrant Member States are likely to outweigh the benefits. By choosing to sidestep the customary consensus-based decision-making system, especially on such a difficult issue, Brussels catalyzed a firestorm of reactions—particularly among Eastern Member States—widening a schism that goes to the very heart of the trust that Member States and the European Commission must maintain if they are to reach agreement on longer-term solutions on this and other difficult issues. Moreover, relocation itself may prove to be beside the point. The failure of EU efforts so far to both convince states to make places available for refugees and to persuade significant numbers of refugees to participate in the relocation scheme (just 232 had been relocated as of mid-December out of 4,097 places made available—both a far cry from the pledged 160,000), has made it clear that migrants and refugees who have already traveled so far will go to great lengths to settle in their preferred destinations. By spending so much political capital on a controversial and difficult-to-implement response, Brussels forewent the opportunity to invest early in dramatically reducing the size of the flows, depriving European publics and policymakers alike of the breathing space necessary to effectively welcome those who had already arrived, and reduce the chaos that defined the last six months of 2015. An Emerging Comprehensive Response or Too Little, Too Late? Yet after so many missed opportunities, the outlines of a more integrated and comprehensive policy response are beginning to emerge. The EU-Turkey agreement on migration and border management signed in November—which promises significant investments in Turkey, visa-free travel, and kick-starting EU-accession negotiations that had languished for years in exchange for help in reducing the maritime flows to Greece, among other things—may set the stage for shrinking flows to more manageable levels through much deeper, if financially and politically expensive, cooperation. Furthermore, commitments by the European Union and national governments (including France and Germany) to make real investments in improving living conditions and livelihoods for Syrian refugees in first-asylum states (such as Turkey and Jordan)—together with the potential for political progress in Syria—may slow the exodus and chaos that has defined it. Similar and additional efforts, however, are needed outside the Syria region. With more than 4.4 million people displaced internally in Iraq, Libya, and Afghanistan combined, in addition to 7.6 million internally displaced in Syria—and with ongoing instability in places such as Yemen and Eritrea—interventions in one country alone will be insufficient. Finally, the European Union is seemingly rediscovering the importance of borders. In mid-December the Commission tabled a proposal to create a European Border and Coast Guard Agency. The proposal is likely to be controversial as it would effectively transfer additional sovereign power from Member States to the European Union. But it will at least jump-start a push towards action out of the incessant rhetoric about border control. Yet the possibility remains that these efforts may be too little, too late. The absence of a clear signal that no effort will be spared to find an end to large, uncontrolled entries—by investing in effective border management, returning those who do not meet the criteria for protection, and addressing the conditions in transit and host countries driving many refugees and forced migrants to move onward—has had several unintended, if predictable, effects. First, countries such as Sweden and Germany, long champions of humanitarian protection, have begun to backpedal on their earlier open-door policies as asylum seekers have overwhelmingly sought to submit their applications there; Germany alone was on track to register more than 1 million new arrivals in 2015. These countries have introduced little-noticed but very important policy shifts: from offering full and categorical refugee statuses based on nationality to case-by-case determinations and temporary protection statuses (that also limit family reunification); limiting benefits for those awaiting status determinations; and making greater efforts to encourage return, including by using accelerated procedures and in some cases detention. A second, troubling effect has also become visible. Public opinion has begun to turn from the remarkably positive views of the late summer and early fall to greater skepticism and concern, resulting in the growing power of the political right. Finally, the clear inability of either EU or national policymakers to stem the flow of arrivals has placed incumbent governments in a politically difficult position. Governments have been forced to constantly renegotiate the middle ground with coalition partners so as to avoid political rifts (as in Germany) and with municipalities so that they will accept more refugees (as in Sweden). As time gives policymakers and commentators greater perspective on the events of 2015, we will be able to make better judgments about the relative wisdom, or extreme folly, of the year’s policy choices. The success of the European Union and its member governments in moving forward the agreement with Turkey and the start of what might become a serious conversation about better controlling Europe’s external borders, together with implementing the many commitments (including relocation) that Member States have taken on following the seemingly endless stream of emergency summits in 2015, will be the crucial test of whether Europe can find a coherent and unified response in 2016. In its absence, we will witness another year of disagreements, blame games, and deepening crises—including a crisis of the legitimacy of Europe’s institutions. European Commission. 2015. Member States’ Support to Emergency Relocation Mechanism. Accessed December 17, 2015. Available Online. Frontex. 2014. Annual Risk Analysis 2014. Warsaw: Frontex. Available Online. ---. 2015. FRAN Quarterly, Quarter 2 April-June 2015. Warsaw: Frontex. Available Online. ---. 2015. Number of migrants arriving in Greece dropped by half in November. Press release, December 15, 2015. Available Online. German Federal Office for Migration and Refugees (BAMF). 2015. Bundesamt verdoppelt Anzahl der Entscheidungen [Federal Office doubled number of decisions]. Press release, December 7, 2015. Available Online. International Organization for Migration (IOM). 2015. Missing Migrants Project. Last updated December 18, 2015. Available Online. United Nations High Commissioner for Refugees (UNHCR). 2015. Refugees/Migrants Emergency Response – Mediterranean. Accessed December 16, 2015. Available Online. In this video, Demetrios Papademetriou, president emeritus of MPI and president of MPI Europe, explains the origins of the refugee crisis in Europe and discusses actions that Europe and other regions can take in the near and long term to address the flows. The Migration Policy Institute Europe, established in Brussels in 2011, is a nonprofit, independent research institute that aims to provide a better understanding of migration in Europe and thus promote effective policymaking.